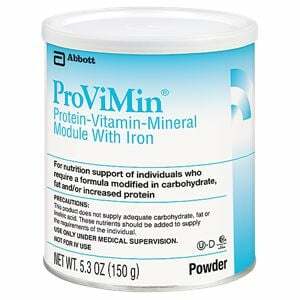 You are buying Abbott Nutrition Provimin Protein Powder Formula w/Iron 5.3oz 6-Pack, model #50260. ADW Diabetes offers a complete line of enteral feeding supplements for both children and adults. The Abbott Nutrition Provimin Protein Powder Formula with Iron 5.3oz 6-Pack is used in management of patients who require a formula modified in carbohydrate, fat, and/or increased protein: abetalipoproteinemia; cholestasis; chylothorax; fatty acid oxidation defects; glutaric aciduria type II; hyperlipoproteinemia type I (fasting chylomicronemia); hypobetalipoproteinemia; lymphangiectasis, intestinal malabsorption of carbohydrate and/or fat; supplement for any patient who requires increased protein, minerals, and vitamins; X-linked adrenoleukodystrophy. For use under medical supervision. High-quality source of protein (casein). Virtually carbohydrate- and fat-free; provides flexibility in prescribing a formula in which the amount and type of carbohydrate and fat can be added per individual infant's need and tolerance. Meets the Dietary Reference Intakes and the American Academy of Pediatrics Committee on Nutrition (AAPCON) recommendations for vitamin and mineral intakes for infants when fed at a dilution of 3.25 g protein/100 Cal. Calcium-to-phosphorus ratio of 1.4:1, which is similar to that of standard infant formulas and meets AAPCON recommendations for that ratio. L-carnitine (40 mg/100 g) and taurine (110 mg/100 g). Never use a microwave oven to prepare or warm formula. Serious burns can result. Does not supply sufficient amounts of energy as carbohydrate, fat or linoleic acid. These nutrients should be supplied from other sources under the supervision of a physician. Do not boil mixture or use terminal sterilization. Sodium Caseinate, Calcium Phosphate, Potassium Citrate, Potassium Chloride. Less than 2% of the Following: Magnesium Chloride, Ascorbic Acid, Coconut Oil, Choline Chloride, Ferrous Sulfate, Taurine, m-Inositol, L-Methionine, d-Alpha-Tocopheryl Acetate, Zinc Sulfate, L-Carnitine, Niacinamide, Calcium Pantothenate, Vitamin A Palmitate, Cupric Sulfate, Thiamine Chloride Hydrochloride, Riboflavin, Pyridoxine Hydrochloride, Folic Acid, Manganese Sulfate, Potassium Iodide, Phylloquinone, Biotin, Sodium Selenate, Vitamin D3, Cyanocobalamin, Salt, and Calcium Carbonate. Special Handling: This item is a special order product that requires up to 5 days for processing. Expedited shipping is not available for this item.